Bosch manufactures Flowpack machines for pouches including product feeding and buffers, flowpack machines with heat or ultrasonic sealing, cartoning machines and Top Loaders. 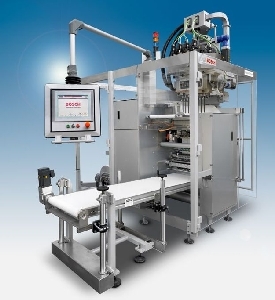 Bosch produces also stick-pack and sachet packaging machines. To the line we can integrate a cartoning machine or a toploader for secondary packaging. These stick-pack and sachet machines are produced for powder, gel and fluid products. The output for these lines are 50-600 units/min depending on the machine model.